The Hotel du Chemin Vert is a charming 3-star hotel located between Place de la Bastille and Pere Lachaise Cemetery in Paris. You will be close to the major sights of the French capital as well as the East of Paris. Everything is planned for your relaxation as for your work ... safety, comfort, entertainment and friendliness, your hotel du Chemin Vert Paris offers all the services essential to your well-being during your stay. The 30 rooms of the Hotel du Chemin Vert Paris invite you to serenity. All rooms are equipped with bathroom (shower or bath, wc, free toiletries, hairdryer), tea and coffee set with kettle, air-conditioning, direct telephone, TV with Canal+, Canalsat, and free WIFI access. With such comfort, you will not want to leave. 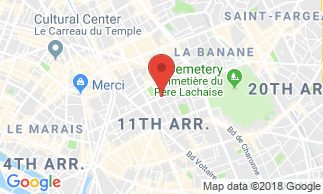 Located between Place de la Bastille and Pere Lachaise Cemetery, enjoy the sights of Paris as well as the East side of the French capital. For a good start of the day, the hotel offers a delicious and generous buffet breakfast from 7:00am to 10:00am. Hotel Du Chemin Vert Un bon rapport qualité prix. J'y retournerai à ma prochaine visite à Paris. Par contre je veillerai à ce que ATEL qui s'occupe des réservations soit clair dans ses explications, me dire que tout est réglé au moment de la réservation et me faire réclamer le paiement à la réception, ce n'est pas correcte ni pour la réception ni pour moi.